The round chair is an impressive design by combining round wicker, frame and cushion create a fluent and natural movement that offers you a feeling of comfort and wellness. There are many beautiful colour cushion and wicker for your choices, also we have The best Min of Quantity Policy and mixed order for each customer! 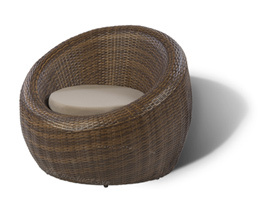 We are specialized in manufacturing Indoor and Outdoor Furniture from Polly Rattan, Water Hyacinth, Seagrass, Bamboo and also very happy to cooperate with reliable customers worldwide. If you want more information about us, please feel free to contact Ms Le My (Mie) via Email: lemy at vietproducts dot vn.